OKIFOLKI: I Am The Warrior. Pagan Ritual. I Am The Warrior. Pagan Ritual. To celebrate the fire festival of Lughassadh this year, we at Bolton Area Pagans held an 'I Am The Warrior' ritual. I've been asked to make this ritual available for those who would like to give it a go on their own at home, and have decided to publish it here, both for ease of reading (as it is quite long when written down), and also for easy access for anyone who is curious about what sort of thing happens at a pagan ritual. The ritual should last about an hour or so. We did this ritual as a group but it can be adapted for a solitary ritual. THE WARRIOR is a person who lives righteously even when it is difficult and takes courage to do so. What 'righteous means in this context is up to you to decide for yourself. Courage is what you need to enable you to do something that makes you afraid, as opposed to bravery which is what you have when you do something without any fear, or without any thought of the (possibly dangerous) consequences. courage is feeling the fear and doing it anyway. You may need courage to defend someone from harm, to speak out on behalf of those who cannot be heard, to stand up for a cause you believe in or to overcome any fears that hinder you from doing the right thing. THE WARRIOR CODE is a set of rules or guidelines to live by. Warrior codes usually include themes like courage, discipline, honour and loyalty etc.. Again, your own warrior code will be up to you, as it is based on your own values and ideas of righteousness. It would be a good idea to write your own warrior code before this ritual if possible although it is not necessary. Having a warrior code will help you focus during the ritual. You might have a very simple warrior code that includes just one rule e.g. The Warrior is self-disciplined. THE WARRIOR'S WEAPON is any item of your choice. This could be a ritual tool (staffs are excellent), any tool of your trade (pen, wooden spoon, pair of pliers) or any item that you feel will help you to live by your warrior code. You could even use an image of your Hero (see below). Use any item that helps you connect with your inner warrior by symbolising the warrior spirit. Have your Warrior Weapon ready for blessing during the ritual. THE HERO is anyone who you feels inspires you to live up to your warrior code. It could be a historical figures (Oscar Wilde, Boudicea, William Wallace, Jesus), one of your ancestors or a member of your family, living or dead (your Aunty Nellie, your Dad), a deity, mythological or fictional figure (the Morrigan, Dr. Who, Achilles). Try to think of your Hero before you do this ritual. THE WARRIOR'S TATTOO. This ritual will include a henna tattoo in the form of a sigil. Please follow directions with your own henna and check that henna tattoos are acceptable at work. WAR PAINT will be used in the form of face paints. This can be washed off immediately after the ritual. You will also need to have a mirror handy so you can see what you're doing. If you do not wish to paint your face you should wear a mask. Any mask will do, but one that inspires your inner warrior would be best. Alternatively you an apply your usual make-up as the war paint part of the ritual, or you can trace the design of your 'war-paint' using oils or herbal-infused-water. BATTLE CRY. You will need something that makes a noise. It doesn't have to be a drum although drums are ideal. You could use a stick and stone, a spoon and plastic food container etc. At a stretch you could simply clap your hands, but it would be better if you could use something that serves as an instrument. Have ready a percussion instrument of any kind. OUR ENEMY is anything that stands in our way, preventing or hindering us from following our Warrior Code i.e. living righteously. This can be a person (or people) although it is more likely to be thoughts, feelings, actions/lack of action, or circumstances. Finally - think about what clothes to wear. Anything that makes you feel more like a warrior would be good. Firey colours are especially good - red, yellow, gold, white, orange. Or for a more protective ritual, wear black. Basil-infused water - If possible infuse some spring water with basil for seven days and nights before the ritual. Incense - Frankincense for protection, strength and courage. Creating your sacred space - Bless and define your space by wafting incense around the perimeter of the circle. Go over the perimeter again sprinkling your basil-water. If you are alone, make the circle of a size so that the radius is roughly the size of your own height. Ritual Cleansing - "I hereby wash away all obstacles that have hitherto prevented me from being the warrior. Be they thoughts" (dip your finger in the basil-water and use it to anoint your forehead...), "feelings" (...your heart), "actions" (...each hand), "or circumstances obstructing my path" (...each foot). "Through this ritual cleansing, I am now free to be The Warrior. I am The Warrior." Mask/War-Paint - Wearing a mask helps us in two ways. Firstly, it frees us from the restraints of our own self-consciousness and personality, enabling us to act like the spirit portrayed by the mask, free from our own inhibitions. Secondly, it projects that spirit to others who see us. They no longer see us as we were, but see us as the mask-spirit, in this case they see us as The Warrior. Their expectations of us, along with our knowing how they see us, further enables us to behave like the mask-spirit we wish to become. Apply your war-paint or mask now. I used red face-paints and the I Am The Warrior sigil illustrated below. The sigil makes a good warrior mask because it has 'eye-holes', but you can use any design you prefer. Once your mask or war-paint is on, look at yourself in the mirror and say 'I Am The Warrior'. 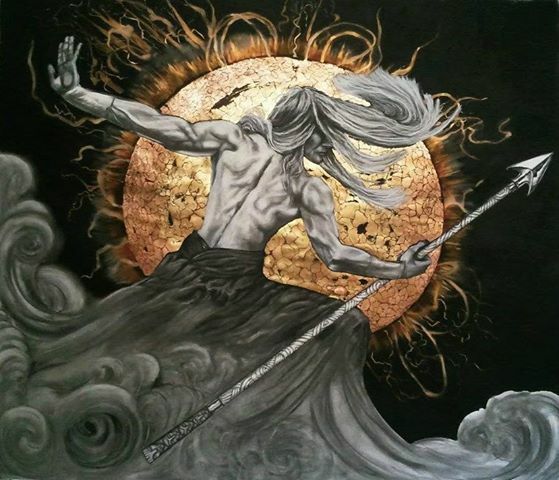 Anointing Of Weapons - "Shining Lugh of the long arm, keeper of the fiery spear of Gorias, I salute you and recognise your power of warriorhood. Hero of heroes, as you inspired my warrior mentor, inspire and assist me. Teach me if you will, all I need to know, of fire and air, of all skills, of weapons and tools, and of my own ability to go forth and destroy inertia and apathy, and bring new peace where it is needed. Charge my weapon with these properties. Let it become a symbol of your firey spear. Teach me to recognise and control the warrior within me. Teach me to embrace my own true strength, courage and energy." Anoint your weapon using the frankincense-in-sunflower-oil in three places: top, middle and bottom as follows: "For Lugh is the warrior" (bottom), "As my hero is the warrior" (middle), "So I Am The Warrior" (top). Vanquishing Enemies and Shield Of Protection - We're all adept at protecting and fighting for our loved ones. We hear ourselves say 'You can do what you will with me but if you cross my kids/partner/dog/etc then woe betide you!'. We often find it easier to love others than to love ourselves, and our love for others burns so hot that we find that firey warrior spirit rises easily, enabling us to protect and fight for them. We're now going to tap into this energy using our warrior tribe. Obviously if you're doing this ritual in a group, the group becomes the warrior tribe. If you are doing this ritual alone, you need to imagine in your circle all your loved ones who have or who would fight for or protect you. Before you do this part of the ritual, it is important to remember who our enemies are. Our enemies are any thoughts, feelings, deeds or circumstances that challenge our warrior spirit or prevent us in any way from living out our warrior code. Turn anticlockwise to face outwards from your circle, brandishing your newly charged warrior weapon. "Foes of mine and foes of my friends, by the power of Lugh, and the power of my hero, I AM THE WARRIOR, and I bid you be gone! RAWRR"
Turn anticlockwise to face inwards. Your enemies are now vanquished and you can take a moment to feel the protection from your warrior tribe, and to encourage some self-protection. It might help to imagine into your circle those whom you are easily able to protect, as well as those who make you feel protected. Hold your arms out to the sides as if you were holding them behind the backs of the people standing either side of you, and imagine them doing the same, all around the circle, forming a shield of protection. Knowing that your warrior tribe has your back now, you can safely carry that protection forward, so that you shall find yourself able, through your memory of this shield of protection, to protect yourself in future. Apply a henna tattoo to the inside forearm of your non-power-hand. (Your power hand is the one you use most often, and your non-power-hand is the other one.) The shield of protection tattoo is a small circle with a dot in it (also used by astrologers as the sun symbol). "By the power of Lugh, and the rising power of the protective mother goddess, I am protective, I am protected. I Am The Warrior!" In the future, any time you feel you need to call on your shield of protection, you can simply raise your arm in front of your face with the tattoo facing outwards. Battle Cry - Using your drum or other percussion instrument, play a march. That is a beat that goes one-two, one-two, one-two, one-two....or oom-pa, oom-pa, oom-pa. The words to the battle cry are very simple: 'I Am The Warrior, I Am The Warrior,' etc. I have uploaded a video of the tune to sing this to. It's not a great video, and I apologise for that, but it seemed like the best way to get this part of the ritual across. Play out the beat and sing the tune either out loud or in your head. Repeat this over and over. The Warrior's Journey - It would be best if you could play the beat of the battle cry while the next part is read out to you. Playing the beat at the same time helps to occupy your conscious mind so that your subconsciousness is free to absorb the journeying instructions. If you can't do this, you might be able to find another suitable piece of music to have playing while you read the instructions. Take your time with this part and allow plenty of time to pause, close your eyes if it helps and really concentrate on what you're being instructed to think about. Remember those negative feelings. Feel again what you felt at that time. Those negative feelings are our warrior lessons. It is from these bad vibes, these feelings of regret, that we are spurred on to do better next time, to learn from our mistakes. Take a moment to really remember those feelings - either the fear, anxiety or nervousness that prevented you from doing the right thing, or the feelings of regret that you felt afterwards. These feelings might be a knot in your stomach, butterflies, a lump in the throat, dry mouth, sweaty palms, shaking hands, wobbly knees, sickness, breathlessness, dizziness, heart pounding, burning in the pit of your gut. Really FEEL these feelings again. Evoke the sounds, smells, taste, touch and sights to remind you and bring that feeling back. Concentrate. Observe. Let it grow. This is your adrenaline - the fight or flight reflex. It enables your body to run away, have superhuman strength, to reach beyond your normal capabilities. Notice what shape this feeling is within your body. It could fill the shape of your head, chest or abdomen, or it might be like an amoeba shape within your body. Concentrate on that shape and watch as it starts to condense and slowly starts to turn into a ball shape. Turn it red, glowing like a burning lump of coal. As it grows smaller and more ball-shaped, it gets more concentrated. Harder. Stronger. Let it change colour - from red to orange. To yellow. To gold. To white. That lump of coal is now so dense and concentrated and hard, it is like a ball of diamond, and is now a brightly glowing orb of power. Let it travel to the pit of your stomach if it is not already there. This is the birthplace of your warrior spirit - it's place of conception, its place of creation. Let its power glow and shine so bright that the edges of the ball shape start to blur because they are so glowing. Let that glow grow bigger, whiter - blindingly bright. You now notice that what came from feelings of fear, has now turned into a hot, firey energy. It comes from the pit of your stomach and makes you feel excited and jittery. It makes you want to MOVE, to DO something. Go with this and allow your body to move - to bounce, shake, twitch, dance etc will all encourage this energy to grow, and so you can nurture your Warrior Spirit with movement. Continue with the battle chant while you do this, until you can really feel your Warrior Spirit within you, and your ability to nurture it. CONGRATULATIONS! You have now learned how to turn your fear into fire, and have found, awakened and energised your Warrior Spirit! 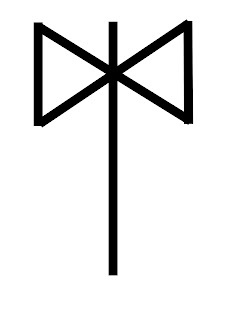 This sigil is made up of an 'I', an 'M' (for 'am), and a 'W' (for 'warrior'). It looks like an axe with a double head, both a tool and a weapon, both protective and attacking. This sigil tattoo is best placed on your power arm (the arm of the hand you use most often). You can place it on your forearm, upper arm or shoulder, or even the back of your shoulder blade. Finally - Think about the person you want to be, and how you can use the past and the present, the good and the bad, to influence the future. The future path you take, and the future YOU that you want to be. When you are celebrating hallowen you must not forget your next day duties. Because if you stay late at night you might get late for next morning. Thank you I got the actual sigil tattooed on my right shoulder blade. I will do the ceremony to seal the deal!